In Reading Between the Signs, Anna Mindess provides a perspective on a culture that is not widely understood-American Deaf culture. With the collaboration of three distinguished Deaf consultants, Mindess explores the implications of cultural differences at the intersection of the Deaf and hearing worlds. 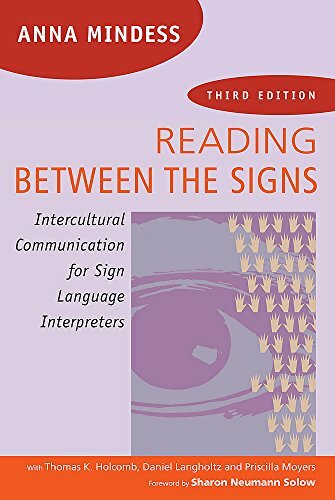 Used in sign language interpreter training programs worldwide, Reading Between the Signs is a resource for students, working interpreters and other professionals. This important new edition retains practical techniques that enable interpreters to effectively communicate their clients' intent, while its timely discussion of the interpreter's role is broadened in a cultural context. New chapter explores the changing landscape of the interpreting field and discusses the concepts of Deafhood and Deaf heart. This examination of using Deaf interpreters pays respect to the profession, details techniques and shows the benefits of collaboration. If you have any questions about this product by Harris Communications, contact us by completing and submitting the form below. If you are looking for a specif part number, please include it with your message.